Precision Air are your local experts for radiant heating installation, replacement, and repair. We can upgrade your existing heating system to a highly efficient radiant heating system that will improve your home's efficiency! Call us today at 1-844-386-0719 or contact us online to get started with a free estimate in Nashville, Franklin, Murfreesboro and the nearby areas. Hot water baseboard heating: Also known as hydronic baseboard heating, this is the most common type of radiant heating used in houses. Hot water is pumped into pipes in baseboard radiators, forcing cooled baseboard water back for reheating. Closely spaced fins on the pipes promote heat radiation and also heat transfer by convection. Old-fashioned radiators: These bulky, upright radiators can still be found in some older houses. They were typically supplied with steam rather than with hot water. Because it takes more energy to produce steam, these systems are not efficient. That's why they're usually replaced with modern hydronic baseboard radiators or compact, wall-mounted radiators. 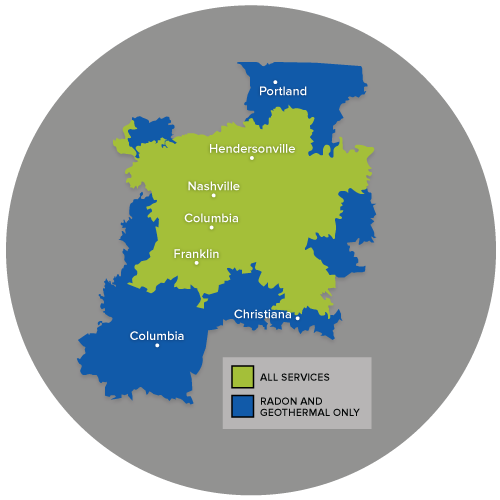 If you're interested in replacing your existing heating system or installing a new radiant heating system, the experts at Precision Air are here to help. We provide complete radiant heating installation, replacement, and repair services, and we'll help you get the right solution to make your home more comfortable and save you money. Call us today at 1-844-386-0719 or contact us online to get started with a free estimate in Nashville, Franklin, Murfreesboro, Antioch, Hendersonville, Brentwood, Smyrna, Lascassas, Madison, Hermitage and the nearby areas.